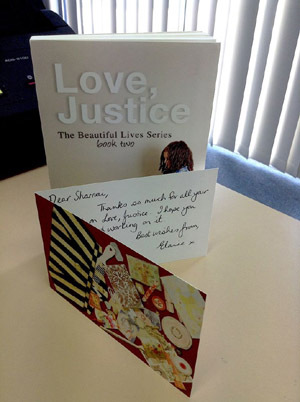 It's been an absolute pleasure working with Elaine Fraser from Beautiful Books on "Love, Justice". The ebook and print project has kept us busy for the last few months, and we're finally seeing the layout in print. This project was the second book in the Beautiful Lives series. The first book, “Perfect Mercy” we assisted with the ebook conversion. 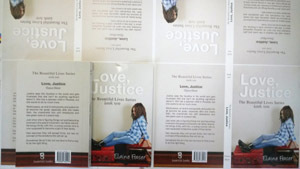 The next book “Love, Justice” we had the project from start to finish. 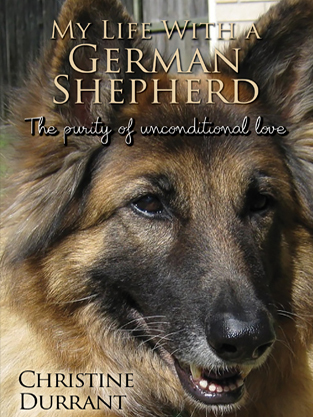 Once we had received the edited files from Elaine we laid the text out in InDesign and started the cover design, using images from a photoshoot by Steve Fraser. We love how the cover image is so closely linked to the story.It’s exciting to use a dedicated image, rather than a stock image. For the print book cover we followed the wooden floor over to the back cover to make the design more exciting and matched the colour of the floorboards with the blurb. We used the original design of “Perfect Mercy” to guide us in the layout and the cover design. The books needed to sit nicely together on a bookshelf, so we were careful to make sure they were the right size and used the same fonts. We did enlarge the type size on the spine on “Love, Justice”, as we believed the first book’s type was a little too small for comfort. For the interior we used another of the photoshoot images to enhance the introductory page to the novel. We then used a stock image to create the header images for each chapter. The theme of Justice’s letters to her diary and to family and friends was enhanced by the book motif. Once we had the pages laid out and Elaine had confirmed it, we sent the files to a printer overseas. We received a sample copy to confirm the design, and we made a few tweaks at that point. When Elaine was happy with the final outcome we put through the order for the large print run. Five advance copies were ordered and arrived about a month ahead of the shipment of the rest of the books. While the printing was happening we began the ebook conversion process. We used the PDF we created from InDesign. As the ebook didn’t need to be printed, we were able to use colour images throughout. We did our best to keep the ebook and the printed book as similar as we could, so we embedded the fonts used in the typeset design. Because reflowing ebooks can’t have images behind text, we had to omit the image used in the introductory page. A sad omission, but the use of coloured images adds the vibrancy lost. 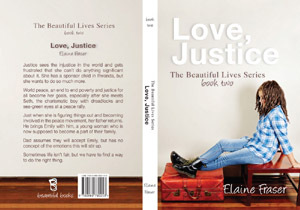 The ebook was published on Kobo, Google Play, NOOK, iBooks and Kindle in August, and Elaine will begin to distribute her books in mid-September, once they arrive in Australia. 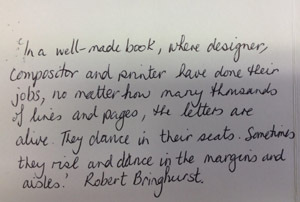 Recently we received a lovely card along with one of the advance copies of the book. Thanks Elaine!